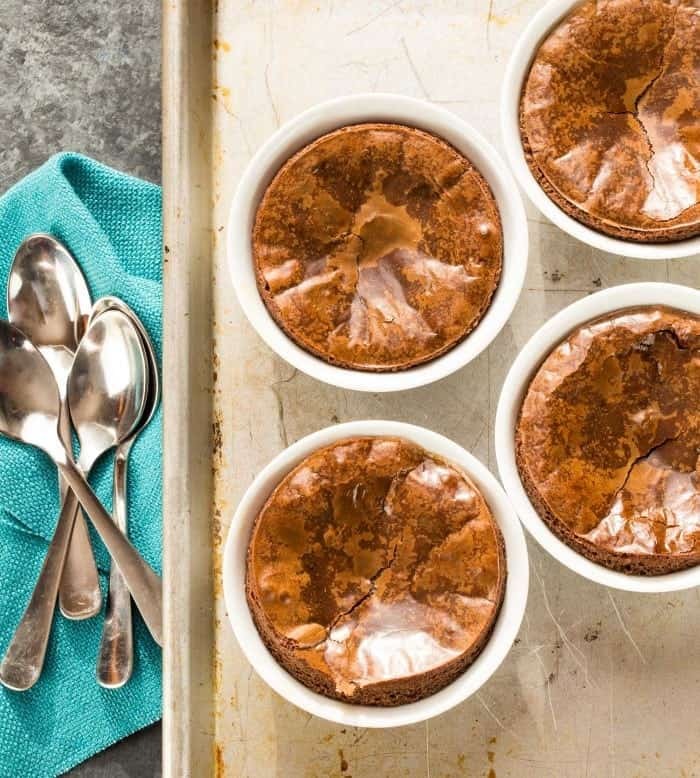 These warm Molten Chocolate Cakes look decadent but are a quick and easy dessert you can whip up in minutes using ingredients found in your pantry. Need a quick and yummy dessert recipe? Put this in your back pocket and pull it out when you have last minute guests or even for a midweek surprise. What’s more fun than surprising the crew with dessert, especially a tray full of warm MOLTEN CHOCOLATE CAKES?!?! These cakes are super easy to prep, and they can bake while you’re eating dinner. I’m betting that you even have all of the ingredients on hand right now: chocolate chips, butter, flour, eggs. The only thing you might not have is superfine sugar. Do you need superfine sugar? I recommend that you use it. Regular granulated sugar doesn’t dissolve as well into these soft cakes when they bake, resulting in a gritty texture. But never fear. Pulse your regular sugar for 30 seconds in a blender or food processor, and you’ll have a close enough version of superfine sugar without having to make another trip to the store. The smell of these chocolate cakes is intoxicating, and I guarantee you’ll be salivating to eat them right away. Resist the temptation if you can. There is nothing worse than ruining a perfectly good dessert with a burned tongue, so let them cool for a few minutes after baking. Then break out the vanilla ice cream for an extra dose of decadence, and enjoy the looks of adoration from your family. Job well done. Tip: My kids love chocolate, so I toss in some white chocolate chips for a little visual interest, but feel free to leave them out entirely or swap in dried cherries, regular chocolate chips, butterscotch or peanut butter chips. The options are endless! Preheat the oven to 400 degrees. Butter 4 ramekins using 1 tablespoon butter and place buttered ramekins on a sheet pan. Bring a small amount of water to a simmer in a small saucepan. Place a heatproof bowl over the water (making sure it does not touch the simmering water). Add the chocolate chips and stick of butter to the bowl. Stir until melted. Set aside to cool slightly. In another bowl, whisk together the eggs, sugar and flour. Stir in the cooled chocolate mixture and the white chocolate chips (if using). Divide the batter between the 4 ramekins. Place ramekins on a baking sheet and bake for 18-22 minutes. Watch them carefully as they can quickly overbake. The tops will crack but the chocolate should remain somewhat gooey underneath. Remove from oven and cool slightly. These are awesome!! I’m tempted to make them for dinner tonight. Fun! Thanks, Cassie. They are sinfully delicious but oh-so-worth-it! i’m a sucker for anything chocolate. these look fantastic! Thanks, Katie. It’s hard to go wrong with chocolate! I don’t own ramekins. Can I make this in a corning ware dish? Hi Rachel, I’ve only made these in ramekins. I’m thinking that this recipe might not work in one large dish as the edges would be done long before the center (even though you want the center to be “molten”). Do you have any oven safe coffee mugs or cups? You could try that as an alternative to ramekins. Oh wow yum, these look so delicious! I love a good molten chocolate cake. I just watched the movie “Chef” this weekend. I can’t help but think of him screaming about the molten cake! haha. Anyway, I’m a sucker for that gooey center! I usually make lava cakes on Christmas Eve, but didn’t this past year. Think these will be added to our Easter menu! These chocolate cakes looks amazing! What an easy recipe too! Love recipes that don’t require a stop at the store! 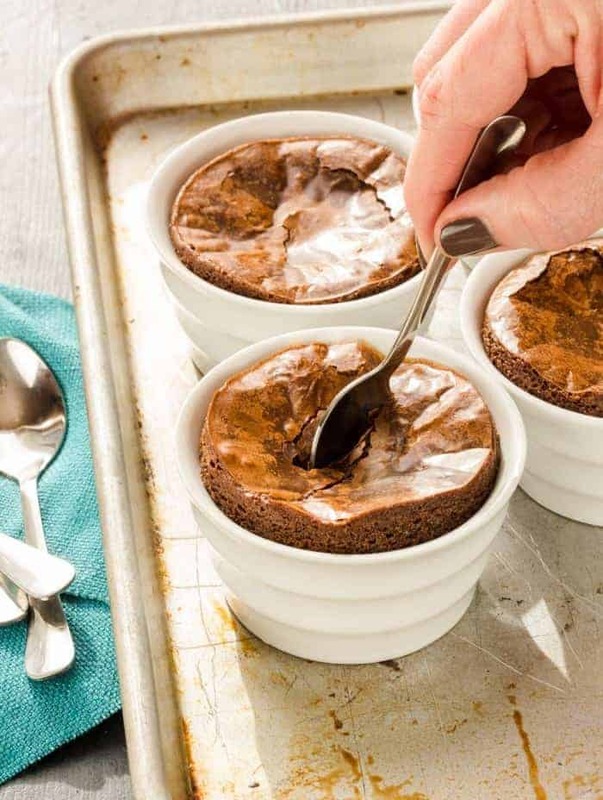 I’m totally addicted to molten cakes. These look fantastic! One of my favorites with a scoop of vanilla! These look like perfection! Agreed; vanilla ice cream is a MUST! Always wanted to make them and didn’t know it was so easy to make, thanks! So easy and soooo good. Enjoy, Wanda!